In many industry applications, compressors rely heavily on filter quality in order to ensure high efficiency. This applies in particular to air separation plants, which are often in operation for periods of 12 to 24 months without ever shutting down. Plant protection and filter lifetime are key aspects for compressor intake air. The filter solution for the given compressor application must be 100 percent reliable, with quickly available spare parts and simple filter exchange process. We would be happy to assist you with our competence in this area. 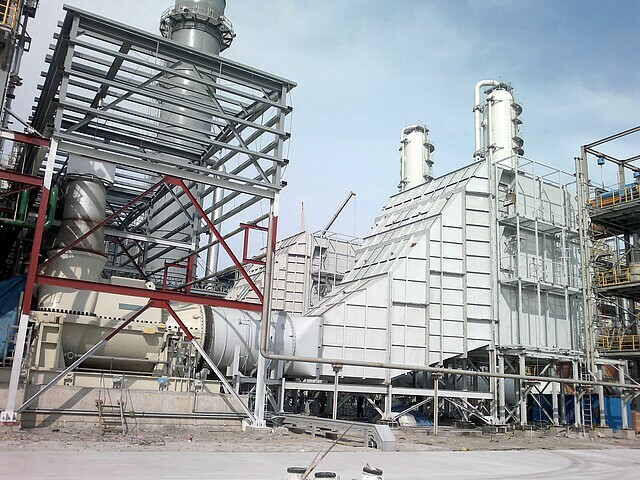 The operation of gas turbines and compressors in warm and humid climate zones poses a real problem. A cool solution for a hot problem: Viledon eee.Sy is an all-in-one system for filtration and cooling of the inlet air. At the same time, the waste heat generated in the process is recovered and utilized in order to improve the performance of gas turbines, compressors and engines in these regions and achieve lower energy consumption and higher plant profitability. Find your ideal filter solution with Viledon eee.Sy. Benefit from our specialized expertise in compressors. Air supply filter house for an industrial gases plant in western U.S.A. Discover our products for gas turbines and compressors. Engineered for applications exposed to continuous water spray or fogging and where filter space must be considered, these filters offer excellent coalescing properties and optimal protection against penetrating salt and water. Offering high operational reliability and cost-efficiency they are ideally suited for intake air prefiltration at coastal, offshore, and other high humidity locations. Here they provide optimum protection of the subsequent filter stages keeping them dry thereby extending the operational lifetime. Prefilters for fine and micro-filters in industrial processes used for supply, exhaust, and recirculating air filtration. High seperation capacity with low pressure drop, long service life, and excellent cost efficiency. A new generation of powerful, efficient, economic and resilient cassette filters. With it's deeper filter depth, this series offer high operational reliability and cost optimization, while increasing the efficiency of turbine performance. Patented quality for extreme conditions. The technically stable and engineered design of the MaxiPleat series offers continuous reliable operation for even the most extreme conditions. With a hydrophobic coating, a patented thermal embossing process, and leak-proof casting, these filters provide dependability with cost efficiency. Reliable intake Air Filtration for Gas Turbines. Viledon MVPGT-21 cassette filters offer an extended filtration surface for an increased lifetime cycle. They are particularly well suited for intake air filtration of gas turbines and compressors, especially for onshore locations. Maximum lifespan, low operating costs for turbomachinery. Pulse-jet filter cartridges GTS, GTS-10 and GTB extend the lifespan of intake air systems with optimal results under all climatic conditions. Static GTG cartridges are best suited for high concentrations of fine dust.